The total number of hospitals reported possible deceased donor (DD) cases during the year 2010 were 97 hospitals. These were divided into either large (>20 ICU beds), medium (10-20 ICU beds) or small (<10 ICU beds). Large hospitals, (14), reported 159 cases (26% of the total). 68% of these possible cases were fully documented and 32 consents for organ donation were obtained (30%). In this group, 14 consents were obtained from King Saud Medical Complex (KSMC). KSMC is continued to be the largest source of consented cases in the Kingdom for the last five years. 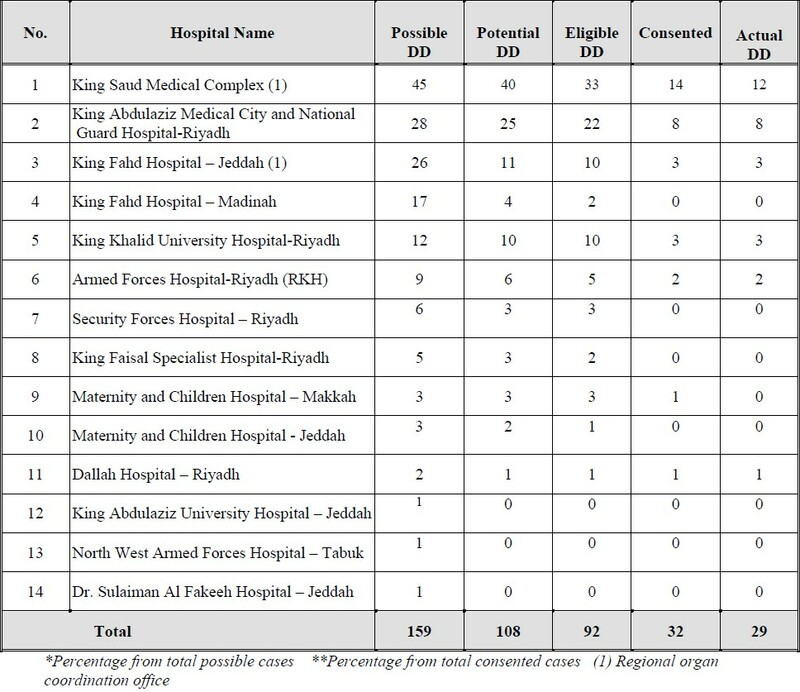 King Abdulaziz Medical City (National Guard Hospital)-Riyadh came next with 8 consents, followed by King Khalid University Hospital-Riyadh and King Fahd Hospital-Jeddah with 3 consented cases each and then came the Armed Forces Hospital-Riyadh (RKH) with two consented cases. Medium sized hospitals, (with ICU beds 10-20) reported 42% (257 cases) of the total reported cases. However, only 36 consents (25%) were obtained for organ donation from this group of hospitals. The most active hospital in this group was Prince Salman Hospital-Riyadh which contributed with 8 consented cases followed by King Fahd Specialist Hospital-Qassim with 6 cases. King Fahd Hospital-Hofuf and Dr. Ahmed Abanami Hospital-Riyadh came next with three consents for each. Besides, two consents were obtained from each of the following hospitals; Al Noor Specialist Hospital-Makkah, King Abdulaziz Specialist Hospital-Taif, King Fahd Specialist Hospital-Dammam and King Fahd Hospital-Al-Baha. Small sized hospitals (ICU beds less than 10) came with a contribution of 170 possible deceased cases (28% of the total) while 33 consents were obtained from them i.e. (34 %). 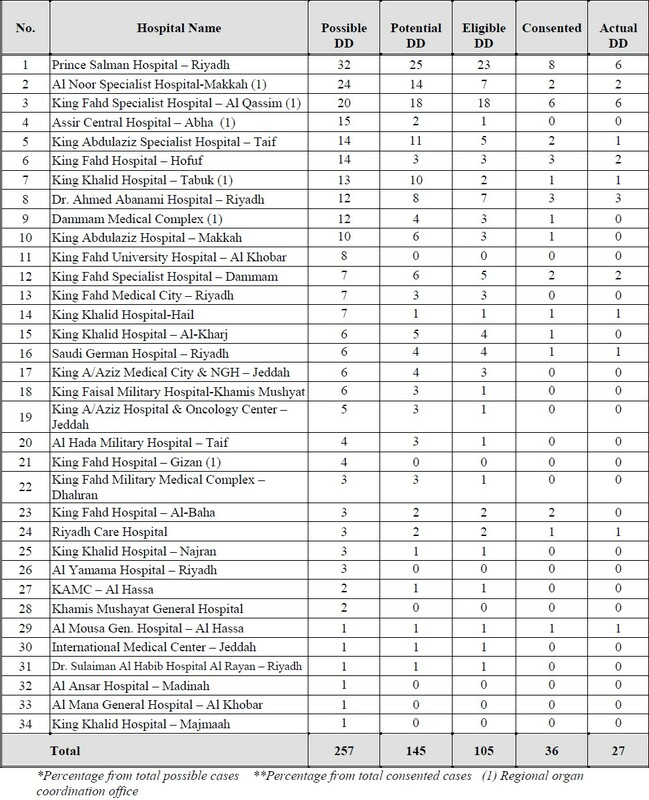 Among this group, Al Iman General Hospital-Riyadh was the most active (7 consents); followed by Obeid Specialized Hospital-Riyadh and the National Hospital-Riyadh with 3 consented cases each. Two consents were obtained from each of the following: Arar Central Hospital, King Faisal Hospital-Makkah, King Khalid General Hospital-Hafar Al Baten, Al Thagr Hospital-Jeddah and Hotat Bani Tamim Hospital. Activities of the organ sharing program between the Kingdom and GCC countries showed that 14 consents cases obtained under this program distributed as follows: Kuwait hospitals (7 cases), Qatar Hospitals (5 cases) and Bahrain Hospitals (2 cases). Distribution of consent cases by region shows that 68 (59%) out of the 115 consent cases were obtained from the Central region (42 from MOH hospitals, 13 from Govt. 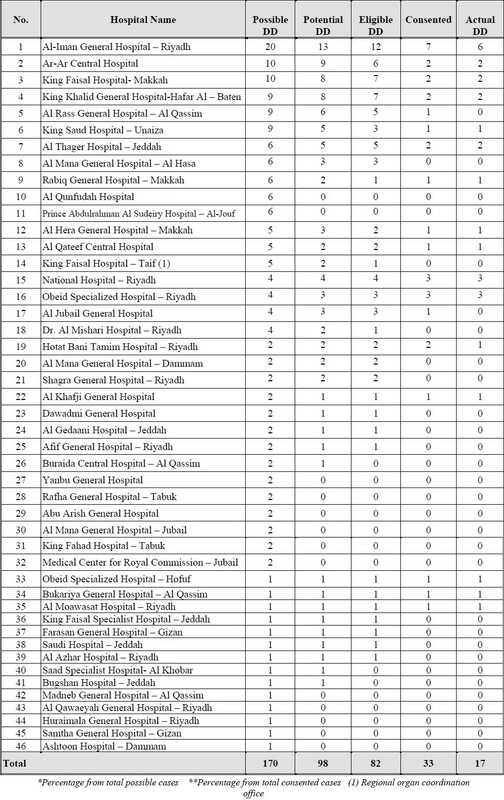 Non-MOH hospitals and 13 from private sector hospitals). The Western region came next with 15 (13%) consents followed by the Eastern region with 13 (11%). The Northern region reported 3 consents while the Southern region two.